The Sunday Telegraph broke the story that became known as Grannygate. Shane Howarth had been playing rugby for Wales since 1998, Brett Sinkinson since 1999, but they were exposed as ineligible. Both were born in New Zealand. Howarth even played four international matches for the All Blacks. They both qualified through their Welsh grandfathers - except they didn't have any. Sinkinson's was born in Oldham, not Carmarthen as claimed, Howarth's in, er, New Zealand! They were both dropped from the Wales team, though Sinkinson later qualified through the residency rule and was picked again the following year. They both went back to live in New Zealand. Welsh joy at winning the Triple Crown for the first time in 39 years evaporated when a Tudor V aircraft carrying 78 Welsh fans and five crew crashed killing 80 people. The plane was returning from Wales' 6-3 victory over Ireland in Dublin the day before. 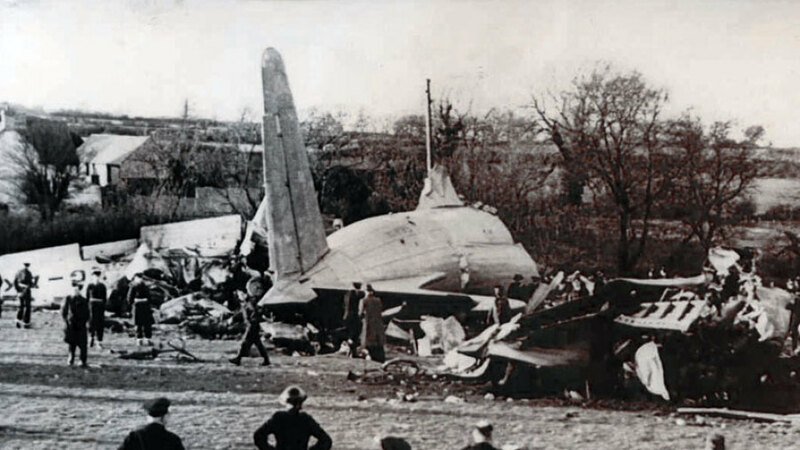 The crash, which at the time was the worst in the history of civil aviation, happened just yards from the outskirts of the Llandow (Glamorgan) aerodrome. Among the many dead were five members of Llanharan RFC including Henry Pascoe, nephew of former Welsh international forward Dan Pascoe. In addition, Abercan RFC lost their captain Don Rowlands, coach Ray Box and star centre Doug Burnett who was the brother of Roy the Newport and Wales outside half. The reason for the crash was never pinpointed, pilot error being the most likely, however a contributory factor could have been improper loading of the plane which shifted the centre of gravity. The owners, Fairflight Ltd, were found guilty of contravening the aircraft's certificate of worthiness and were fined £50 and ordered to pay £100 costs. 2011On the penultimate weekend of the Six Nations Wales took advantage of a refereeing blunder as they beat Ireland 19-13 in hugely controversial circumstances at the Millennium Stadium. Mike Phillips' crucial try should have been disallowed after Wales used the wrong ball to take a quick lineout, but Irish protests were waved away by referee Jonathan Kaplan and Wales edge a narrow win. "Had the referee gone to the fourth official and asked if it was the same ball then it would have been our line-out but it doesn't mean we wouldn't win the game," Wales coach Warren Gatland said. "It doesn't take the shine off the win for me. I don't care, we won the game. We've had some rough ones in the past so I'm not complaining about getting a decision our way." Mark Cueto's try hat-trick in England's 39-7 Twickenham win against Italy gave head coach Andy Robinson reason for optimism after a sequence of four Test losses. "We're building, moving forward," a relieved and pleased Robinson told reporters after the game, "and that was a step in the right direction." Ireland's first win at Swansea (5-0) since 1889 brought them back-to-back Triple Crowns. The first England Schoolboys international was played against Wales at Cardiff Arms Park - the English Schools Rugby Union had been founded earlier in the year. Wales won the game 23-5. Cliff Jones, legendary Welsh fly-half of the thirties, captained his side to an 11-5 win against Ireland on his 24th birthday and announced his retirement shortly afterwards. Jones played 13 times for Wales in an injury-plagued career that spanned his debut against England in 1934 to the victory at Swansea. Wales beat Ireland 6-0 in the last international staged on the Balmoral Showground in Belfast. Ireland played a total of 11 internationals at the ground between the 8-0 defeat to Scotland in 1898 and the final loss to Wales. Ireland's overall record at the ground was played 11, won 4, lost 7. Wales beat Ireland at Birkenhead, a venue chosen to minimise travelling costs for a then impoverished Irish Rugby Union.